Since a very long time Apple Mac had been hitting on PC with different kind of weird ad commercials across the globe and had been degrading the PC users. Finally Microsoft is back in action and started a new campaign with “I’m a PC”. 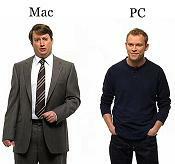 PC users were always degraded by the Mac users and there are series of ads made by people about the I’m a PC / I’m a Mac. You can find all those I’m a PC I’m a Mac ads on YouTube.